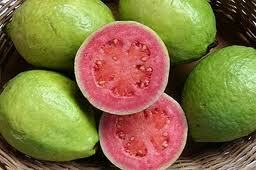 In the Latin it means Guava Psidium guajava. His English Guava. We often know klutuk guava. The fruit is very rich in vitamin C and some types of minerals that can fend off many diseases and maintain physical fitness. The leaves and bark contain antibacterial substances that can cure some types of diseases. Besides vitamin C, guava also contains potassium and iron. Besides anti-oxidants, vitamin C here has a function to maintain and promote health of capillaries, prevent anemia, mouth sores, bleeding gums, etc.. In addition, vitamin C here also can boost the immune system against various inveksi. So we are not easily hurt like the flu, cough, fever, etc.. Vitamin C here also play a role in the formation of collagen which is very useful to heal wounds. The availability of vitamin C is in the blood can cause selenium in inhibiting cancer cells, especially lung cancer, prostate, breast, colon, bladder and brain. Most of the vitamin C guava concentrated on the skin and outer flesh is soft and thick. So, better guava eaten with the skin. Guava fruit is renowned multi benefits. For treatment of canker sores, cut segengam Daum and one finger guava guava bark, as necessary, wash thoroughly, then boiled in water until boiling. Once cool, filtered, and drunk. For bleeding wounds, could dengana terlebh first wash of guava leaves freshly picked, and then milled. Next attach a bandage on the wound, and bandages. Replace the bandage and herbs 3 times a day until healed. Young twigs can be used to treat vaginal discharge (leukorea). The roots can cure dysentery, that is by boiling 15-30 grams of fresh guava leaves and boiled water. Boiled water also can be used to wash wounds. Red guava fruit can be used in increasing platelets in the blood for patients with dengue fever. In addition, guava fruit can be used for the treatment of diabetes (diabetes mellitus), high blood cholesterol levels (hypercholesterolemia), and treat constipation. Guava fruit is advisable to choose the red.